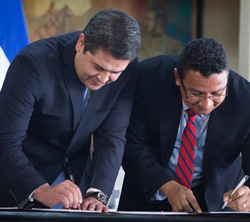 From left: President of Honduras Juan Orlando Hernández and Carlos Hernández, chair of our chapter there, signing last year’s joint agreement. Last week, US vice-president Joe Biden wrote an important article in the New York Times to explain his administration’s plans to channel resources to support security, governance and development in Central America. Biden wrote that in order to sustain economic growth and economic equality in a region plagued by violence, poverty and corruption, you need to strengthen good governance and security in general, and especially good governance of the security and justice sectors. This is a position that Transparency International supports because we know that the very sectors that are meant to guarantee citizen safety and access to justice, core pillars for sustainable economic growth and opportunity, are often the most challenged by corruption and weak institutional capacity to deliver effective and accountable law enforcement. In the context of Central America, people can’t count on governments alone to ensure the safety of the people, especially those most marginalised from power, when corrupt actors can have undue influence in politics and law enforcement institutions. Governments need the carrots and sticks to overcome those influences that only a strongly engaged and well-informed citizenry can deliver. This is why any proposed funding to strengthen governance and security in Central America has to include significant support to independent civil society watchdogs. Biden highlighted the joint agreement to tackle corruption in Honduras – signed a year ago with Transparency International, our national chapter in the country Asociación para una Sociedad Mas Justa and the government of Honduras – as an example of the kind of joint cooperation between government and civil society that has the potential to lead to real change in people’s lives. Any proposed funding to strengthen governance and security in Central America has to include significant support for independent civil society watchdogs in the region. These are the organisations, including our chapters across the region, which have been working bravely, constructively and assiduously to ensure that governments are accountable to the people. They are working to see that the flows of money intended to help people actually do provide them with the opportunity and safety necessary to pursue productive lives. We hope that Congress will support the Obama administration’s request for funding for security and development support in Central America and that whatever budget is finally approved, it includes is strong support for national and regional civil society networks. They need the resources to continue to serve as watchdogs and advocates for transparent and accountable government, especially in the security and justice sectors.